They may have finished second bottom of Unibond Division One this season, but over 2,500 fans still made the trip to Parkside Road in early May to watch Kendal Town in action. The sudden popularity of the side may have been accounted for by the fact that their opponents were a young Manchester United XI in a friendly match staged to mark the switching on of new floodlights at the Cumbrian's ground. The reds won 1-0. Hopes are high for next season as the side formerly known as Netherfield Kendal start again in the same league after the summer re-org of the lower divisions and have retained boss Tony Hesketh, who guided them to an unbeaten seven game run at the end of last season. Seen here in action against Vasco Da Gama, Santa Carina-based Figueirense compete in the Brazilian Championship and play home game at their 24,000 capacity Orlando Scarpelli Stadium. We'll bow out for the moment with a glimpse of Paisley's finest, the men from Love Street. The star of our final TAPIBAW for the moment could have been wearing our black and white, had history been slightly different. Attacking midfielder Ricky Gillies is still a fortnight away from his 28th birthday but aside from a stint at Aberdeen has been a fixture in the Buddies side since his debut in December 1992, when the 16 year-old came off the bench to score against Cowdenbeath. His progress over the next few seasons was monitored with keen interest on this side of the border, with both Liverpool and ourselves said to be keen admirers and the Sunday Sun regularly running tales that Gillies was toonbound. However it never happened and instead a move to Pittodrie came, which proved to be something of a disaster with frequent managerial changes at the Dons. 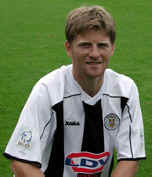 A loan move back to Love Street followed in 2000, which coincided with St.Mirren winning the First Division and was followed by a permanent return to Paisley for the Glaswegian, where he remains to this day.